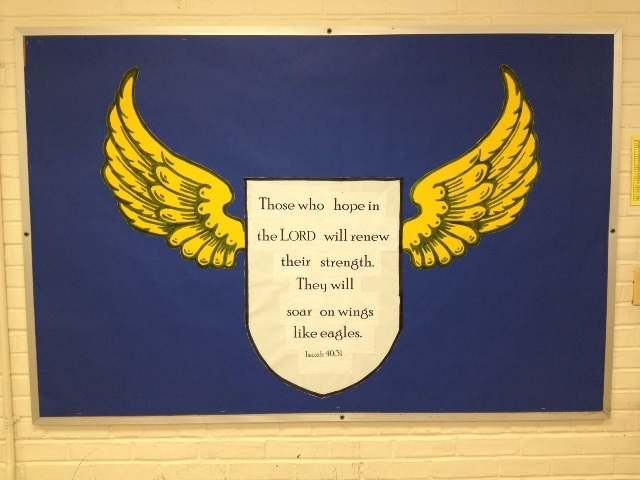 Since I had the theme verse for the year, I could do my bulletin board. I actually have done this verse before. I looked at the design here at Bradaptation so I wouldn’t duplicate it. As I was looking at old bulletin board designs, I noticed that they were more complex than what I’ve done at my new school. I think my goal has changed. I want to teach the verse, so my designs are simpler and the verse is more prominent. Poor Richard font. I thought it looked solid and communicated strength. I used the projector to trace and color the wings,and the shield is traced from a wall hanging that Debbie gave me. Thanks, Debbie! Now that the bulletin board is done, I can do the rest of the room. I will have to finish today, because there is a new student orientation tomorrow. Yikes! There’s nothing like a deadline to help you get things done! I’m so glad you linked to the first one. It was beautiful, but the new one is perfect. It embodies quiet strength. We sang Isaiah 40 in choir, so that is today’s earworm. Thank you!! Did I read correctly that you looked at the old one so you would not do the same thing? I look at the old one so that I don’t have to think of a new one. I’m still glad I don’t have to do bulletin boards. I like the new one, Brad. It stands out and onlooker’s eyes are drawn to it. The expanded verse will be elaborated on in class. But, they will always easily see the shortened version as a great reminder of the power in those fewer words. Love and blessings on your 2015-2016 School Year! It looks great! I really like the simplicity. Glad you could use something from the pile of bulletin board stuff I gave you. Have a wonderful year! I have been looking forward to seeing your new verse art for this year. Your designs are always thoughtful and visually appealing. And I always think about how your kids will be connecting with the Holy Spirit when the are no longer paying attention to you. I am sure that is just the last 2 minutes of your class. How did you create the wings? The wings are from a Google image search. I used the digital projector on some yellow paper taped to the wall, then colored all the black parts in with magic marker.